It’s that time of year again – spring is just around the corner and it’s time to open the windows and start spring cleaning. Just as “less is more” applies to spring cleaning old household item you no longer want or need, it’s also applicable to blog content on your website. 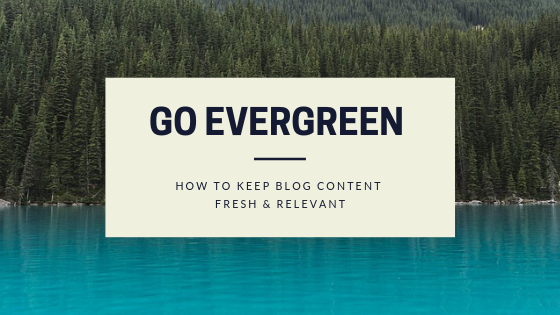 In this blog we’ll walk through the benefits of “going evergreen” and how to identify content worth updating to keep your blog fresh and relevant. The e-commerce space is getting more competitive every year and even obscure niches are now seeing some degree of saturation as entrepreneurs try to enter untapped markets. Therefore, it has become more important to differentiate yourself from the thousands of shopify stores and other competitors. 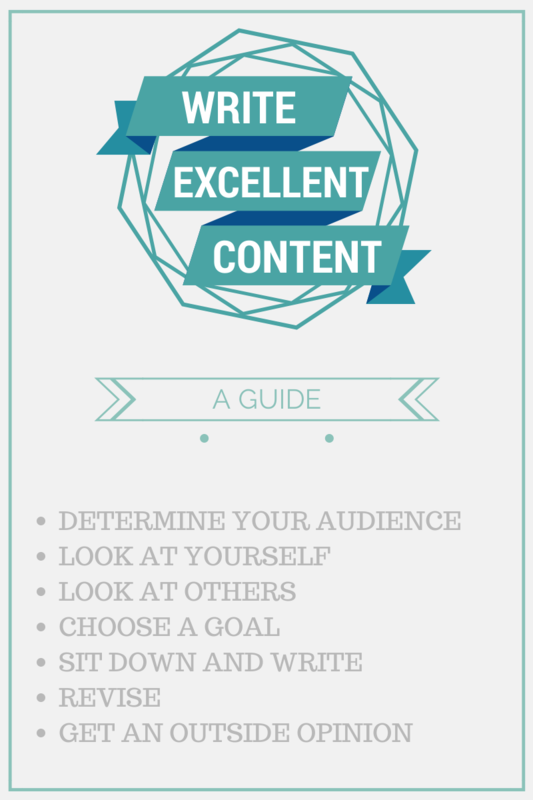 One of the best ways to differentiate is by maintaining a blog with consistently high quality content. In this blog we’ll cover 4 reasons your e-commerce store should have a blog. Blogging can be very beneficial to an eCommerce site, especially one that caters to a particular niche. The blog can cover a lot of ground within that niche and the blog topics would tie in nicely with what you are selling. You get the added benefit of SEO through more content to rank, as blogging is a very powerful way to generate site traffic, then get more revenue as a result. Generating sales leads online for B2B products and services can seem counter intuitive at first. After all, those business deals tend to rely on personal relationships developed over years of networking and sales prospecting. In fact, I know a few B2B salespeople who tend to avoid doing any of their networking online. They claim, “not enough time,” “not efficient,” “not how I work.” That is, until I explain the top 5 factors influencing B2B sales lead generation. Once sales leaders understand the connection between these critical B2B marketing factors and revenue, ears perk up. Funny how that works. Of course, if you’re among those looking for tips to improve your online B2B sales lead generation and conversion efforts, learn from B2B companies that don’t plan for and invest in an online presence. They’re missing out on our increasingly global marketplace, where potential leads can’t visit your office but can still get to know you through virtual means. To differentiate and close more online leads, keep reading. Here are Stikky Media’s top 5 factors influencing B2B sales lead generation if you want to convert more qualified visitors into leads. We can’t say it often enough: your website is the virtual equivalent of a first impression. If it’s old, badly designed or simply inexistent, you’ll miss out on quite a lot of potential leads just because visitors will be turned off. An archaic-looking website jumps out right away, and so do amateur ones. With today’s wide variety of looks and styles, as well as advanced technical possibilities, websites don’t have to be boring. They still need to be usable, but the possibilities are rather close to endless (see some beautiful websites). All of this should be packaged in a visually pleasing website that still follows web usability best practices. The second most important element to convice potential clients is a good portfolio page or, if you’re not in the creative field, at least a few case studies. These are really important because they show how your past and current clients have found success with your product or service. If there’s no proof of your company’s ability to serve what it promises, it’s not likely that you’ll develop any kind of trust with visitors and leads. For example, our projects is a great source of information for our potential clients. There they can find examples of websites in similar fields and categories as their business, and they can check out our work to see if it fits their style and needs. Case studies are a bit different. They go in more depth about the process, solution and results of using your product or services. They work especially well for complex products and services; they also help a lot for companies with long sales cycles. Content is a rather vague and general term when it comes to the internet; basically everything on there is content. For the purposes of this blog post, we’ll consider content the helpful information found on your website. What “helpful” means depends on who your target audience is. Again, companies with longer sales cycles will find that using a variety of content types will help leads move along the cycle faster. Share some relevant content to hook them up, follow up with some great lead nurturing emails, and voilà! a lead that your sales team can close in no time. When you deal with a business, you ultimately deal with its whole team, whether you spoke to them in the sales process or not. So it’s good to know that the people who are going to build your product or provide the services you need know what they’re doing. Bios on team pages can help with that, but do you know what’s more effective? Blog posts. Every member of your team (or at least a representative of every department) should contribute to your company’s blog. As a potential lead looks at your website and your blog, he or she will see that your employees know what they’re talking about and provide helpful advice. If that doesn’t contribute to visitor trust, I don’t know what does! Last but not least, having a presence on social media is among the top 5 factors influencing b2b sales lead generation. A potential lead will also take a look at what you’re saying on social media. There are way too many examples of companies losing bundles of customers because of a mistake on social media (talk with our experts about our online reputation management services, if it should happen to you). A carefully planned social media presence that still lets individuality and human-ness shine through is the best way to convince site visitors that there’s a human behind every interaction. (Nobody likes robots THAT much.) They’ll have a look at how you interact with followers, how fast you answer to mentions, questions and inquiries, and check out the content you share. As in the factor above, make sure that your social media presence contributes to your reputation for expertise and helpfulness. All these factors will make a difference in how many online B2B sales leads you get. Having a strong digital strategy will help you figure out how to put these pieces together to increase your leads, conversions and sales. Need Help Implementing the Top 5 Factors Influencing B2B Sales Lead Generation? Want more details about how you can make your website more effective? Contact the digital marketing experts at Stikky Media to help you convert more online visitors into sales. While blogs are the cornerstone of content marketing, when you compare the number of successful blogs against the total number of blogs that exist on the internet, you’ll notice the ratio is very, very small. Only a fraction of blogs build an audience of more than a few hundred, and only a few rare ones get subscriptions of 100K+. Ever wondered what these top blogs have in common? 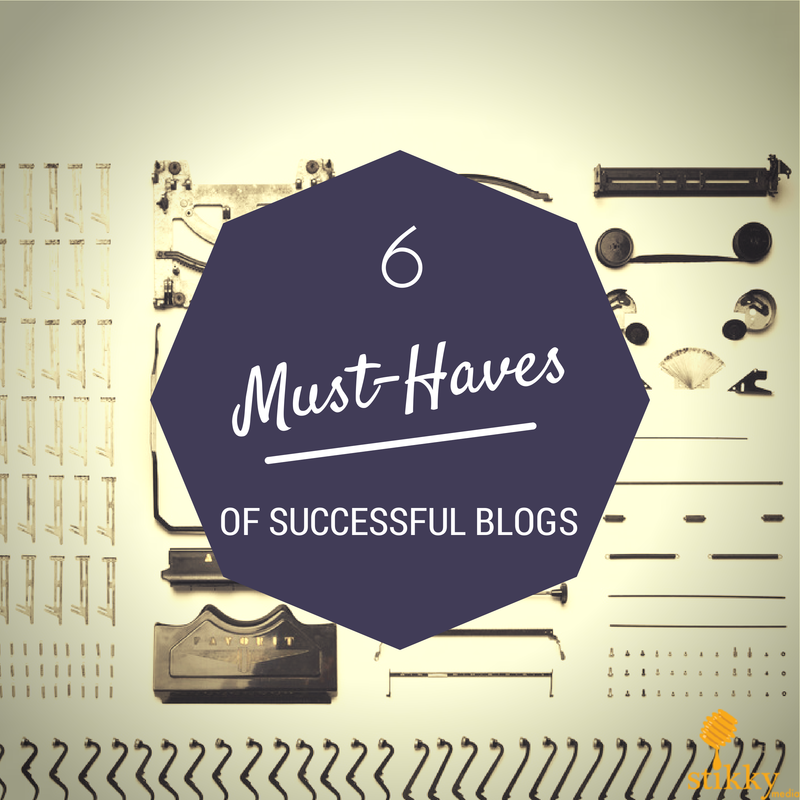 In this blog, we’ll share 6 must-haves of successful blogs. It’s not enough anymore to just provide information. Information is easy to find; there’s a how-to and a listicle for every topic you can imagine, and even those you can’t. What makes perspective special? Perspective is opinion informed by experience. Perspective is personal yet has wisdom for others. When it comes to blogging, readers like to connect to their authors, not the information itself. We like to read from humans, not machines; this is probably the only thing that’s keeping the writing robots from taking over. Perspective is the human element in information, and a unique one is absolutely necessary for a successful blog. What’s your unique perspective? What have you learned through your years in your profession or field? What wisdom can you impart to others? What makes Seth Godin so popular is his compelling ability to compress a lot of questions and thoughts into very short posts. What people love about Mark Schaefer is his honesty when it comes to difficult issues within the marketing field. The list could go on, but if you think of your own favourite bloggers, you’ll see what I mean. Finding a voice is at once the most common and the most frustrating piece of advice you receive as a new blogger. Honestly, there’s no way around it but to blog often and trust that your voice will eventually settle itself. What makes other people listen to you when you speak? Are you funny, perceptive, incisive? This might be a clue to your blogging voice too. We can’t talk enough about the effectiveness of visual marketing. Every successful blog will use visuals to emphasize the message, to summarize the content or to add an emotional touch. We’ve been working with Canva to make awesome blog graphics that are easily reshareable on social media as well. The trick with visuals is that you don’t need to think too hard about it. There are plenty of beautiful stock photo websites (we like PicJumbo, Unsplash and Gratisography in particular) that you can use in your graphics or on their own. Just always remember to put at least one photo or visual in every post. What photos or images inspire you? What emotions do you want to convey? Show us on Instagram. Getting the right content to the right person on the right channel at the right time. Being relevant is a balance between talking about what you’re interested in and talking about what your audience is interested in. If you write about things that you don’t care about, you’ll lose steam quickly; but if you just write about what you’re interested in, you’re likely to lose those readers who don’t share all of your interests. Writing about a variety of topics in different tones–some opinion, some factual, some controversy, etc–will keep readers interested in the long run. Relevance also requires a lot of time spent looking at what others are doing on their own blogs. What would you like to read about if you were an executive in your field? What information would keep you coming back to your blog? Share and follow us on Facebook. Few business blogs can really be useful marketing tools without mailing list. Successful blogs will use mailing lists to send daily postings, newsletters and other offers to their readers. A blog with a mailing list keeps you top of mind and is just standard nowadays. It’s hard enough to keep up with all the content websites publish on a daily basis, so emails are a great way to keep your readers notified of new blog posts. As far as inbound marketing goes, email is still the best tool you have to turn subscribers into leads and to nurture them into prospects and clients. However, make sure that the way you collect your email addresses follows the Canadian Anti-Spam Law, or you could be in pricy trouble. Are you subscribed to mailing lists? What makes you click or delete? If you think that you’ll get visits just by writing blog posts, you need to reassess how you understand the blogging world. Visitors rarely find new blogs to follow through Google; instead, they come through shared links from trusted sources (on a blog they already read, on social media, etc). Your blog should have a constant and active presence on social media, not only for broadcasting, but also for sharing other people’s stuff and having discussions with them. A warning: “not doing” social media is the surest way to banish your blog to the obscure abyss of all the unread stuff of the internet. You don’t need to be on there 24/7–this is what automation is for–but at least be there a few minutes every day to share your content and engage with others’. Do you strategize your social media or do you just go with the flow and inspiration? Retweet and share your thoughts with @stikkymedia on twitter. What element is missing from your blog? Is there something on the list that your blog is missing? You can still have a great blog, but maybe it’s not working as well as it could. Our 6 must-haves of successful blogs work together to get the best marketing bang out of your blogging buck, so it’s worth spending some time refining them. Which is the one that is the most difficult for you? Get in touch with our team of digital marketing experts to discuss your blogging challenges and how we could help. I don't know a blog writer who doesn't go through writer's block sometimes. Yet to keep your website fresh and current, you need to keep updating your blog with interesting content that keeps your visitors coming back for more. So what do we do when we're really, really out of ideas and still need to write blog posts? 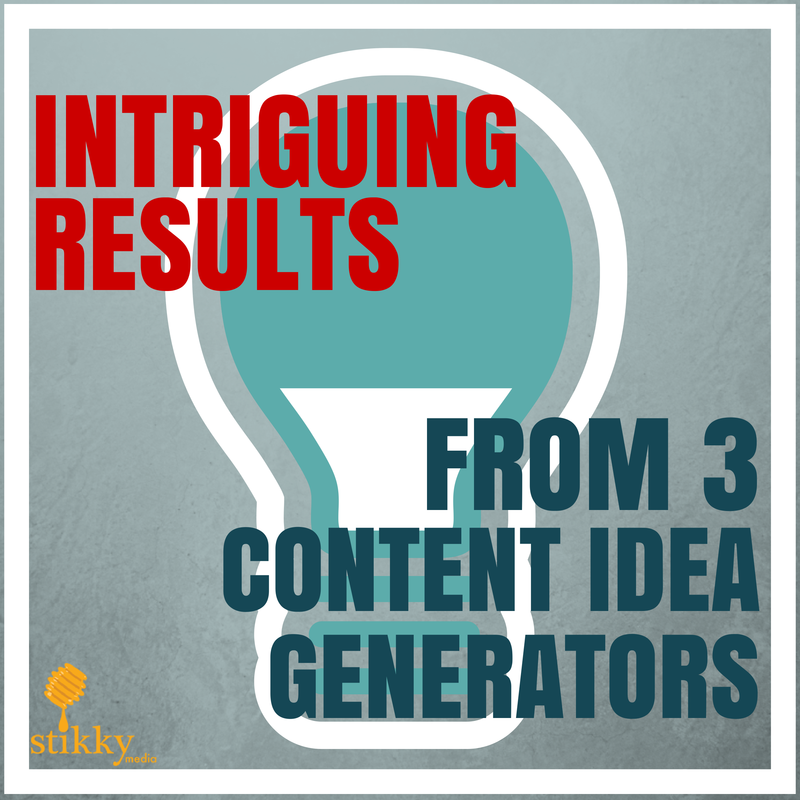 Fortunately, there are content generators we can use to get our brains storming. In the three examples I used, you input a noun or two and the generator spits out sentences (blog post titles, mosty) incorporating those nouns. Many of the results are over-the-top SILLY and many of them you will find simply unusable. However, they take any key idea and instantly spit out such a baffling variety of possible directions that they can be beneficial to any blocked writer. Content Row's Link Bait Title Generator offers ideas that, like Hubspot, are mosre suitable for serious or informative blog posts. It's a convenient one because it spits out the most results per search so you're able to scan through many results with a quick glance. However, most of them are completely irrelevant for our comparative search. Which of these results would you be most likely to use? Is there one that stands out that you could run with in writing? My personal favourite is from Portent's Idea Generator: “7 Unexpected Ways Writer's Blocks Can Give You Better Hair”. I tend to tug on and fiddle with my hair when writer's block gets me frustrated. Next week I'll blog about THAT! Spring cleaning: clearing up the cobwebs and dust, washing and opening the windows, bringing fresh air to the house. And you can also do that with your website. Okay, so it’s officially spring only for a few more days, but it’s never too late to spring clean your website content. One part of the content management cycle that doesn’t really get its due when we talk about content strategy: archiving and removal. Because you posted it back in the day doesn’t mean it should be there forever. Actually, cleaning up old, stale, irrelevant or inaccurate content is something you should do regularly. Why? I thought you’d never ask! We put a lot of work in SEO. We spend hours optimizing tags, revising our content and making sure that we rank for the right keywords. But are these keywords those that you used a year or two years ago? Like with every good business strategy, your content strategy changes with time. Your objectives may have changed; your services or products may have mutated into something different. Do you still want to rank for old, irrelevant keywords? One secret to SEO is keeping your site fresh and up to date. Don’t ruin your current efforts by letting old content fight for your SEO ranking. Sometimes, old content can screw with your marketing efforts. Take ours for example. A long time ago, a co-founder of Stikky Media (who isn’t with us anymore) wrote a blog post about the history of CGI in movies. While that’s great and everything (and the post was even used as a source on Wikipedia), the post has very little (i.e. nothing at all) to do with digital marketing. The post has quite a bit of traffic and lots of comments. “But how is that a problem?” you ask. Well, first, it doesn’t put our firm in a very serious or professional light. It’s a company blog, not a personal one. This post can lead to potential clients questioning our expertise (if they’re digital marketing experts, why are they making such an obvious error?). The post also attracted a lot of traffic that we didn’t want on our site; i.e. people who aren’t interested in digital marketing. This post skewed our efforts at analyzing our traffic and seeing what visitors are really interested in. It has an effect on bounce rates, time spent on site, and number of pages visited, at the very least. Whenever you talk about websites, you need to consider the user experience. Whether it’s through slick graphics or excellent content, the user is really the one you should please–not yourself. Old content, especially popular old posts that still get traffic, can become frustrating if the content becomes out of date or inaccurate. Even if that out-of-date post still gets a ton of traffic to it, and fits your SEO and marketing goals, it still needs to be revised, archived or removed. If you have old posts that provide information that is no longer useful or accurate, you might want to review how you can update the information and bring traffic to it instead of your old post. I like to do a content cleanup at least every year–it’s the very minimum. I set aside a day or two to review all the content–blog posts, landing pages, site pages–for accuracy, timeliness, spelling errors (they ALWAYS sneak in), broken links, etc. It’s a bit boring, but it’s necessary. Kind of like cleaning your house. When’s the last time you cleaned up your content? How often do you do it? How has it improved your digital marketing results? If you need help with your content marketing, get in touch with our experts. It's Father's Week at Stikky Media! Since Father's Day is coming up this weekend, this week the Stikky Media blog is going to celebrate dads on the internet. For our first post of the week, we're going to (you guessed it) share with you some of our favourite daddy bloggers. Well, why does anybody? But it's interesting to see dad bloggers taking their space in the parenting blogosphere, which is generally skewed towards moms. Parenting is often the work of two, so the other half of the equation should also have a voice. Dads blog because they also have parenting insights and experiences to share. They may be different from moms', but they are no less important or relevant. Without further ado, here are our favourite dads on the web. I met Rick Shetty, the Daddy Blogger, at Social Media Camp last May. This Vancouver-based dad has a widely varied blog with everything from the usual parenting posts to reviews, giveaways and events. Not everything is about parenting, so it's also a nice blog for people interesting in living on the Lower Mainland too. Life of Dad isn't a dad blog per se, but rather an online magazine for dad bloggers. There's a community built around it and a variety of content for dads and dad bloggers. I like the variety of voices on this website and how some of the stuff (like recipes) is really useful for everyone, not just dads. Brian Sorrell writes Dadding Full Time, a blog about emigrating to New Zealand from the US, being a full-time at-home parent, and travel. The tone of the blog is often nostalgic, but always touching. There's some funny stuff too. He's a great storyteller. Jerry Turning is a police officer with an autistic son who writes about his experiences on Bacon and Juice Boxes. He doesn't blog very often, but when he does, it's always interesting. I'm glad people are more open about raising autistic children. That's the question many parents ask themselves after they've had children. Eric and Laura Corpus co-author this parenting and lifestyle blog from New York City. Their kids are definitely cool, and so are they. What happens when a Star Trek fan starts a dad blog? Tales From the Poop Deck, authored by Creed Anthony. Read his Captain's Log and laugh along this geeky dad's adventures in parenting. There's only so many people we can feature, but if you think we missed anyone important, feel free to share your favourite daddy bloggers in the comments! Content this, content that, content here, content there: content is everywhere. I've made my argument elsewhere that it's an important part of your digital strategy, no matter your business size or type. 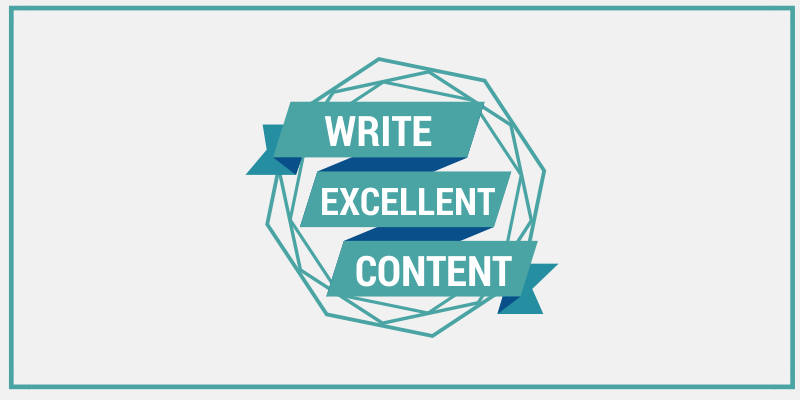 And in order to reach your marketing and sales objectives, your content must be excellent. But I realized something lately: that lots of people don't really understand what excellent content means, or how to reach that level of quality. The web is clogged with sub-par, badly written, uninteresting, plagiarized and useless content. Quality content isn't that difficult, but it requires a bit of thought, lots of practice and some advice from colleagues, clients and friends. Over the years, I've developed a not-so-secret method for excellent content and I'm going to share it with you today. This advice is actually contrary to a lot of what you'll read on the internet. You'll often hear "start with your passion!" or "write for yourself!" Although it's good advice for writing in general, when producing content for business, the roles are reversed. You're not writing to express yourself through art; you're here to inform, convince or entertain. If you don't know who you're talking to, at least in general terms, your content can easily miss the mark. Let's use an example. If you are in the beauty business, your audience is probably women. A blog post about beauty trends for men is not likely to interest them… unless it's about how to get their boyfriends and husbands to adopt a beauty routine. One topic has many different angles, which may suit different audiences. It's a bit how we convince our boss to adopt a new technology vs. how we tell our employees of the upcoming technology change. In rhetorical terms, this is called audience analysis, and it is the first step for any business document, including business blog posts. Who are you? What are you values, your goals, your aspirations? What fascinates and interests you? Who do you look up to? Who inspires you? Gathering momentum from myself is the way I start every piece of content. If I have already chosen a topic, I will do an inventory of my knowledge about it. What do I know about this? What do I not know? What are my questions and assumptions about this topic? This section will often take the form of notes, especially if this is a new topic for me or if it's a longer, research-based document. But because I'm an experienced writer, I do this part automatically for most blog posts. Beginning writers will find notes useful to get started and to structure their content. It's also really important to determine your own perspective on a topic. It will often have an effect on the tone and overall style of the piece. If you have an unusual or polemical perspective on a well-known topic, for example, you should take it into account. For example, I have a certain attitude towards SEO, and I'm not shy about it. But I'm honest and I can defend this opinion–and hopefully change other people's too. Nobody knows everything about everything. Even in subject matters where we are experts, there's always something new to learn (or so I hope!) Looking at what others are saying about your topic is an important part of getting excellent content out there. You don't want to repeat what's already been said: you want a new perspective, a fresh take, a second opinion. (See step 2.) This step also involves doing factual research to support your claims (like statistics) and to fill gaps in your knowledge. In rhetorical terms, this is called context analysis. You need to know in what context your content will be consumed to position it properly within that context. Now that you know who you're writing to, what you're going to talk about and what other people are saying, you need to decide to what purpose you are writing. Are you writing to inform? Keep your tone neutral and factual. Are you expressing an opinion? Use a personal style and argumentation techniques. Are you trying to entertain? Humour and a lighthearted language will work well. Your purpose in writing will dictate the language, format and flow of your piece. For example, this is an informative piece. The flow is logical and has a step-by-step format. My post on sexualized social media ads was meant to be persuasive: I wanted to convince you to avoid using these types of ads on Facebook. The piece follows the typical nuanced opinion format and there's more of my personal voice into it. Your goal is at the heart of the language, formatting and style choices you will make for your piece. This is simultaneously the easiest and the hardest part of producing excellent content. Especially for beginning writers, the fear of the blank page and a lack of confidence can defeat even the most determined. But if you're a business, it needs to be done. So there's no good reason to fret, delay and procrastinate. The writing will only be finished if you start it. When you start writing more frequently, you'll figure out the routine or motivation techniques that work best for you. The secret? Don't give up, experiment and keep notes about your writing efficiency. Your writing doesn't have to be perfect on the first draft. I repeat: your writing doesn't have to be perfect on the first draft. Revision is just as important to writing as knowing your audience, getting ideas and writing the first draft. Think of revision as a way to "re-envision" your content with fresh eyes. Revision isn't just proofreading. Revision means being open to rewriting, restructuring and sometimes completely changing a piece. This is why getting plenty of time to write helps: you have time to let your piece rest before going back to it. Sharing your writing with colleagues before publication will help you notice things you might not have during the revision phase. Writers tend to get really close to their own writing, and it's easy to overlook things like assumptions, faulty logic, red herrings and other rhetorical mistakes. Before you hit "Publish", make sure to have at least one or two people read through your content. Of course, your beta readers will also note grammatical and spelling errors that you might have missed. It's okay; everyone makes these errors. As long as you correct them before publishing, nobody will ever know! Here it is. Producing excellent content isn't magic or rocket science; it's applying a workable, efficient writing process every time you sit down to write. This process is just a model; you can change it and add or remove some steps as you wish. Some people prefer to share their content earlier in the process to get feedback as they compose; others would rather show the most polished writing they can manage. How about you? How do you approach business writing or content production tasks? Share you own process with our community! Having a blog is now pretty much standard fare for business content marketing. Most companies and organizations have blogs. But only some of them update it. And then only a portion of those actually does it well. As a professional blogger, I've seen it all: the ultra-serious finance blog, the light-hearted lifestyle blog, humour blogs, review blogs, health blogs, news blogs… pretty much anything you can imagine. If you can imagine it, there's a blog out there about it. But because there are so many of them, a majority of the blogs that exist don't have much of a readership. There's only so much human attention to spare between millions of different blogs! So when we suggest to our clients to add a blogging component to their digital marketing packages, it's not just for padding: blogs have a use and lots of value. But only if it's done well. And in order to do it well, a blog owner or manager has to answer a few questions. Whenever I'm asked to contribute to a new blog or start a new one myself, here are some of the things that I work through to do the job as successfully as possible. Audience is a very fickle thing. It can be wide swaths of people or a tiny slice of population. The larger the audience, the harder it is to please everyone; more specialized audiences, on the other hand, are harder to grow. Choosing the right audience, then, is a matter of balance between choosing a wide enough target to have a sizeable audience and something precise enough that will let you pinpoint specific characteristics. Target audiences can be as large as "moms" or "university students" and as precise as "sci-fi tabletop RPG players who live in Winnipeg." When you write a blog post, who are you talking to? Are you targeting a specific gender, age range or education level? Are you writing for a specific geographic area or to anyone who can read English? Putting a face to your audience will help you talk to it more efficiently. 2. What problem am I trying to solve? People visit the internet mostly to solve problems. Maybe they're looking for a recipe for tonight's dinner. Maybe they don't know how to file their taxes online. Maybe they don't know what's the most romantic spot for a date in their town. Most successful business blogging involves problem-solving… or at least information that can lead to problem-solving. Thinking through the perspective of problems makes things a lot easier when I'm looking for ideas. Frequent questions and concerns from clients is also an excellent source of blog post topics. Solving specific problems also has the advantage of limiting the scope of the post to something manageable and quickly digestible. It means posts are never too long and are always informative. 3. What makes me (or my brand) special? Maybe you're the life of the party or love telling jokes. Maybe you treat customers as if they were family. Perhaps you're very frank and like to tell it how it is. What would your friends say is the best thing about hanging out with you? The answer to this question should guide how you write your posts. Because there are probably thousands of other blogs covering your topic, it's your voice–the combination of words, tone and style that make your own writing unique–that will make the difference. It's easier to identify with, and get attached to, a real human being with a personality than some neutral, detached robot voice. Think about how you talk about your business with your friends and family. What words do you use? How do you express your passion and love for what you do? What makes you… you? 4. What will be of use to my readers right now? This is somewhat related to question 2, but it involves taking timing into consideration. Season changes, holidays, major news and events (when they are related to your business) are all occasions to discuss topics under a theme. People in the moving business, for example, might want to increase their blogging output in major moving seasons–May and September in a university town. A landscaping company can discuss how to protect delicate plants against the winter weather in the late fall. The topics are endless. Thinking seasonally helps you not only with finding topics but also with solving timely problems for your readers. 5. What kind of expertise do I want to bring to the world? When it comes to writing, I'm the expert at Stikky Media. I'm asked to look over my colleagues' work before they send it off to clients. I answer grammar and usage questions all the time. I continually try to improve the writing of all the DBI websites. I'm the writing expert. Some people learn on the job and others are experts before they work, but eventually we all become experts in something (if only changing your own oil on your car or fixing a broken bike chain). This expertise is precious, because others can rely on it to, again, solve their problems. Your blog is a great way to display your expertise to the world (without being a smartass about it though!). If you do it right, you'll soon be known as "the barbecue guy" or "the computer girl". Share your expertise widely–and freely–on the web. It's those who give up things for free (not everything!) and generously help others who tend to be the most successful in their business. It gives people a reason to listen to your advice! Despite the doom and gloom around the overcrowded blog space, I'd say there's always place for a new, fresh voice. It's not like we've stopped buying books because there are already plenty of successful authors! So take a sheet of paper, write these questions down and then answer them. Give your blog a refreshing boost! Blogging is great for business, but it’s a tricky world to navigate. Between concept and promotion and the writing itself, it’s easy to fall into these deadly traps. Your blog is engaging. It’s authoritative. Sometimes it’s even funny. But is it all it can be? Here are a few easy ways to spruce up your blog and keep readers coming back for more. Not completely convinced that your business should have a blog? Remember this: Content is king. 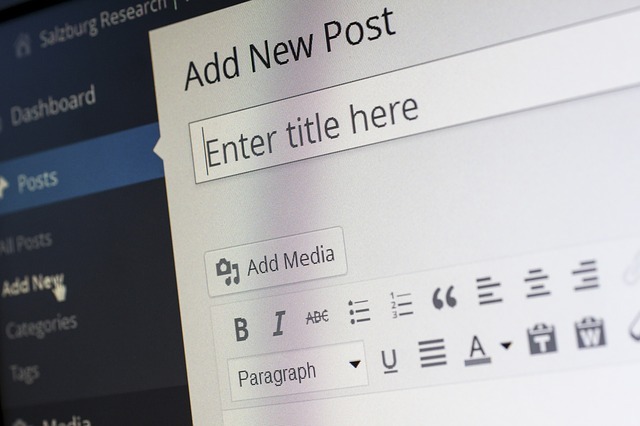 And with the abundance of both free and inexpensive blogging platforms floating around the web (WordPress being one of the most popular), there’s no reason why your business can’t set up a blog and start connecting with customers in a matter of minutes. Social Media nerdry, gambling, and four days in a city that seemingly has no connection to the real world. It doesn’t get much better than that. BlogWorld New Media Expo 2010 in Las Vegas, Nevada was all that and more.